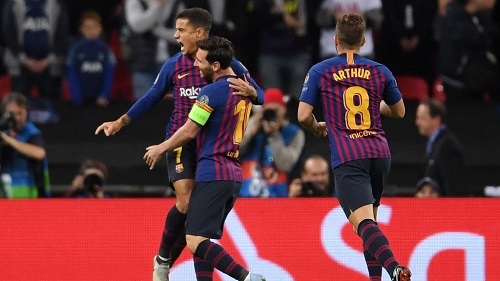 FC Barcelona continued their winning streak at Wembley Stadium with a 4-2 victory over hosts Spurs in their second Champions League group stage match. The Barça goal scorers were Coutinho, Rakitic and Messi. This result meant they and Inter both had 6 points and will be fighting for top spot when they meet at the Camp Nou on October 24. The Blaugrana were looking to end their three game winless streak and their night got off to a great start when Coutinho scored after 95 seconds thanks to some bad decision making by Spur backline and keeper. Ivan Rakitic doubled the lead with an amazing strike from outside the box in the 28th minute to make it 2-0. Harry Kane managed to pull one back for the Spurs in the 52nd minute, only for Messi to restore the Blaugrana’s two goal lead four minutes later. Barça would pay for some defending when Lamela scored the Spurs’s second goal of the night but Messi struck the final nail in the coffin when he scored the club’s fourth and final goal of the game in the 90th minute. Five goals in two matches thus far for Messi and hopefully the Blaugrana can use this result to get back on the winning track in league play when they travel to face Valencia on Sunday. Goals: 0-1, Coutinho (m.2); 0-2, Rakitic (m.28); 1-2, Kane (m.52); 1-3, Messi (m.56); 2-3, Lamela (m.66); 2-4, Messi (m.90). Cautions: Alderweireld, Wanyama, Lamela, Dier & Kane; Arthur & Busquets. Previous PostBarça winless again after 1-1 draw to Athletic. Next PostBarça struggle again with 1-1 draw to Valencia.